Bouncing Bellies & Flashing Fingers: Welcome to the Grow Your Blog party! Greetings and Salutations! I'd like to welcome all of my visitors to my little corner of the internet. My name is Tazzy aka Ladynero and I am a cross stitcher, a novice crocheter, and a beginning belly dancer. 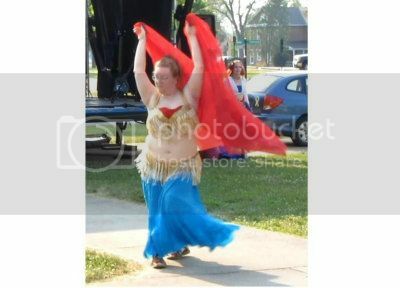 This little blog, while focusing more on my stitchery and crochetting, also occasionally features my belly dancing experiences. There is going to be a lot of pictures in this (sorry, I enjoy showing off a bit) but I hope you enjoy your little stop in my corner. As I have irregularly participated in the WIPockalypse in the past two years, let me snag a challenge from the WIPockalypse creator, Measi: "This month’s topic is a proper one for the beginning of any adventure: Introduce yourself, your projects, and any goals you have for the year." My name is Tazzy as I said. I was born and raised in the Midwest United States. I'm happily married with one daughter and two cats (who enjoy seeing what Momma's stitching as well as playing chase the string!). I'm a beginning belly dancer, and hopefully things will work out between home life and my work where I'll be able to get back to shimmying and shaking. I work at a little mom'n'pop craft store that specializes in a little bit of everything and where I get a majority of my needlework supplies and crochetting things. I'd like to get all of my current projects finished this year and distributed to their recipients before starting anything else new. I am an irregular blogger, but I try to update once a month (emphasis on try). I'm not one to talk about what happens to me personally, mainly because I started this blog for my needlework and belly dancing to share with everyone else, but I enjoy reading the various comments left on my posts. This picture is a couple of years old (I was actually in my first trimester of pregnancy when this was taken. It was my last performance. For now). It was for Memorial Day when the troupe went to perform at the local Veteran's Center. We had one older gentleman in a wheel chair that kept moving closer and closer for our performance. Claimed he couldn't hear the music. I doubt any of us believed that excuse but we didn't call him on it. 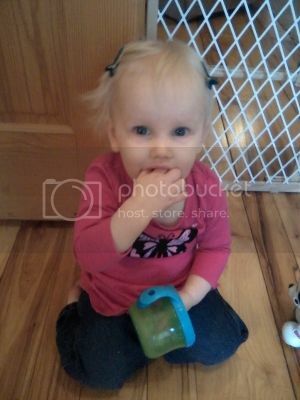 Meet my daughter, Genevieve. She's 13 months old, active as all get out, and only gives me a few hours at night to get anything done, but there are times when I'm just worn out after a day of playing and chasing her around, that I can't summon the energy to pull out a needle and thread.However! I have managed to get some things started and worked on. I won't go through and show you everything that I have started because that will take a lot of pictures. Yeah, I'm a bit of a serial starter, but a few of my projects only have a few stitches in them (Persephone, a few HAEDs, and a few things that are aimed for the UFO piles for now). First up is a blanket I'm crochetting for Genevieve. Been working on it a while, but it's a nice relaxing project that I don't have to think too much about in the evening. It's a modified ripple blanket to shrink it down from full sized to a lap blanket. When it is done, it will also be the perfect size for her crib. This is HAED QS CLara by Hannah Lynn. I'm doing all the black first and then going to go back and color it. A friend of mine saw this when I was showing it off at work, and she fell in love with it. So I promised her I'd stitch it for her if she followed her dreams (She had a habit of letting a few things hold her back). I haven't had a chance to work on it lately as it's 1x1 on 28 ct Monaco and that gets a bit hard on the eyes in the evening, but it will be worked on. The start of Joan Elliott's Fairy Godmother on Silent Night by Under the Sea Fabrics (wonderful lady who does hand dyed fabrics. Highly recommend her!). This is going to be hung up in Genevieve's room when it's done and I get it framed. I'm also debating on changing the hair color of the Godmother from blond to black, just to be different. Ah well, I'll get to that when I get to that. This is the start of a sailing ship sampler from Cross Stitch and Country Crafts issue Jan/Feb 1989 which tells how old this is. The water's green and I offered to change the colors for my dad, whom is the giftee of this one, but he liked the water as green. So, green water it is. This is Barbara Baatz's December Fairy on 14 ct Aida, dyed by Color Cascade Fabrics based out of Australia (another great lady who does gorgeous work). The fabric is an odd size, but there is some beautiful marbling on one corner that I'm doing my best to get involved in this. I'm making this into a baby announcement for Genevieve with her name at the top and her birth information at the bottom. 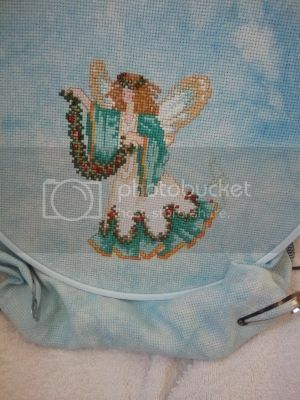 The border that is going to be done around the fairy will be repeated at both top and bottom but turned at 90 degrees to be more horizontal than vertical. The fairy herself is almost completely done. There's just some back stitching in the garlands that need to be done and then I can focus seriously on the borders. This one is actually for me. It's Joan Elliott's Goddess of the Sea from the Design Craft kit. I do wish they had included 28 ct fabric instead of 14 ct, but if wishes were horses then beggars would ride. Ah well. 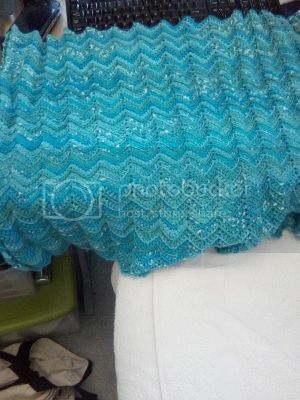 If I decide I don't like this as it is, I may just get the pattern from Joan's website and redo it. But we'll see. Here is my jar of ORTs for the TUSAL that Daffycat runs for the fun of it. This is a bit over a years worth of thread ends and leftover threads from kits. 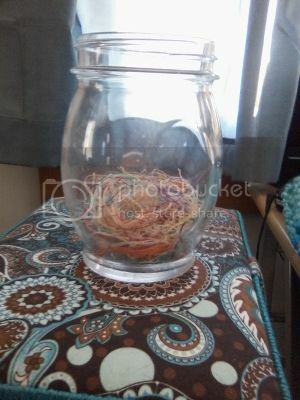 I never know what to do with the extra threads from kits, and I can't exactly add them to the skeins of DMC I have due to color differences at times, so I throw them in here to be used later or to be tossed out for the birds to use in their nests come springtime. I think I'm going to wait until this is full before dumping it out this time. Last time, there wasn't really that much to make a difference. I had a lot of fun making this with my dad. It's my stitching chest where I keep almost all of my cross stitching WIPs. I designed it, and together, over the course of a couple of weekends, we put it together. My mom picked out the handles and the pull knobs, surprising me when they brought it over. I use it constantly and am starting to get a few drawers that still stick to loosen up due to the constant use *laughs*. Now I just need to get small boxes made to hold my bead containers and my kreniks. I'm giving away two prizes this time. You don't have to be a follower of my blog to win, just have to be comfortable giving your address to a complete stranger *laughs*. First, I don't have a picture of (sorry, my phone's battery died), but it is "Jane Pattison 1806" by Shakespeare's Peddler. It's a sampler reproduction, and while it looks nice, I'm not one for this sort of sampler. So, I thought I'd pass it along to whomever is interested in winning it. 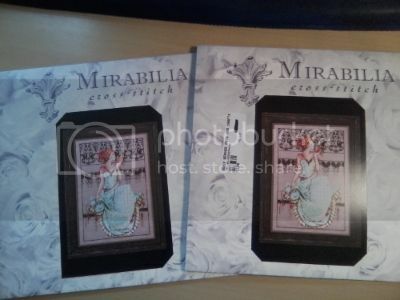 The second winner, by random drawing, will receive a copy of Mirabilla's Persephone. My boss knows I enjoy Mirabillas so she went to a needle show and bought a copy of Persephone for me. Only I had already ordered it with fabric from another supplier, thus giving me two. So, one will go to a lucky person. How to enter: Just leave your name and address in the comments and if you want to be in the drawing for either of the patterns or both. I'll draw a random person on February 15th to give everyone plenty of time to enter as I know there are a lot of blogs in this little party, and I don't want to exclude anyone. 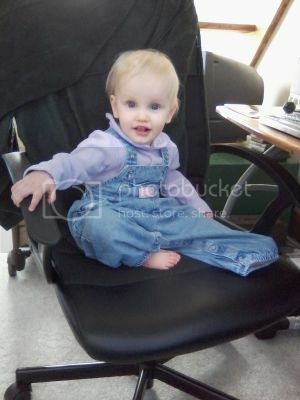 And finally, I'll leave everyone with a picture of Genevieve in her CEO position, sitting in her daddy's chair at his computer. Cute caption for the 'CEO': Get back to work! Lovely pattern, btw. Love cross stitch. Your daughter is too cute! Your projects all seem to be coming along very well. I'm totally a serial starter myself so I know how it goes. I'd like to enter your giveaway. My email address is tikistitches@gmail.com. Thanks. I'm one of the volunteers for the Grow Your Blog party to make sure the links on Vicki's post are working correctly. Your cross-stitch work is beautiful! You must have lots of patience to work on it... I used to cross-stitch, but I think I have to get magnifying glasses before I attempt it again! Your little girl is CUTE! I especially like her in her CEO chair. Your daughter is a darling! I know too well about munchkins taking over past hobbies. One day you will get back to dancing. Your cross stitching looks fun, I used to cross stitch but then had girls. The chest you made is fabulous, I wish I had something like that. Hello Tazzy I 'm very happy, and I'm nice to meet you!! .... your blog is very nice! I'm following now, happy Grow your blog!! What a sweetie your daughter is. I can understand the lack of time for crafting with her being so young. 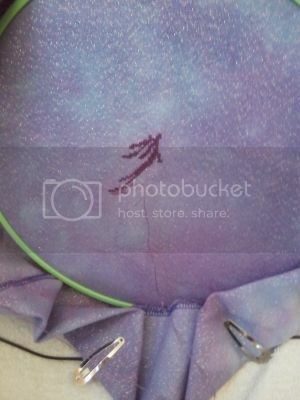 I LOVE the name of your blog, and the stitching (especially when you show the progress) is lovely. Nice to meet you. Here via GYB! Love your blog--your little one is a darling. We're here visiting from the Grow Your Blog party. Your cross stitching is impressive! Hi, nice to meet you and your lovely daughter. You do beautiful work. Enjoy the hop! The CEO is adorable. You certainly have accomplished quite a bit of stitching. Wow! I love cross stitch. However, I haven't been able to ply my hand to it. I finally had surgery on both my eyes in late November and go my new Rx for glasses this month. Last week I started having double vision again. It's impossible to thread a needle and see the holes with double vision. So, I need to call the neuro opthamologist, again. Thank you for growing your blog. Also, thanks for the great giveaway. My first preference would be the sampler. 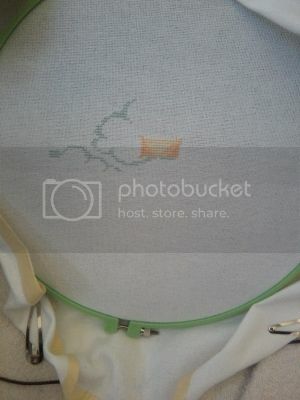 Hello from another stitcher! Your daughter is adorable. I hope you're enjoying this party as much as I do. your Genevieve is just adorable! I love that you belly dance, it's something I've always found rather fascinating. Hope you have lots of fun at the party! I have a belly dance exercise video that I used to workout to, but would never belly dance in public. Go you! I don't cross stitch so please leave me out of the drawing... Thanks for sharing your blog. I can't wait to read more posts. 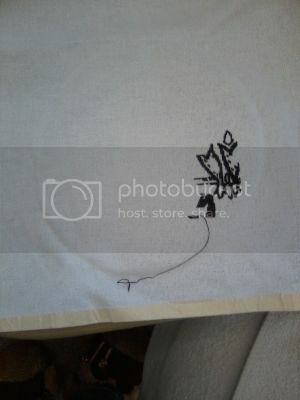 I am an embroiderer participating in Grow Your Blog too. (having once done it professionally in my past!!!). Your daughter is a sweetie and your stitching looks gorgeous! Happy blog hopping and come over to see some collage stitching of a different sort! Hi, Tazzy! I'm running a little late on the GYB party, LOL. You have a wonderful blog! Hi, nice to meet you! I like your blog and giveaway! I think I'll follow! Just email me for my address! If I happen to win! Your baby is beautiful! 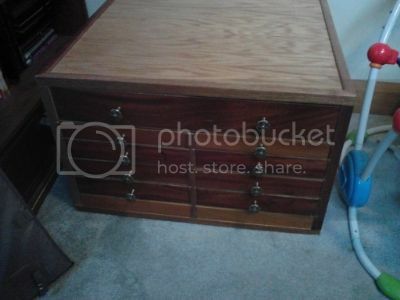 Your stitching chest is great! Enjoyed your blog. I love x-stitching! I got the quilting bug last year and have been high centered on it. :) I also love crocheting. Thanks. I'm visiting from the gryb party and you are very talented and patient!. I will definitely be visiting again. Your daughter is so cute!! I'm still plodding through the links for the GYB party and have just landed on your lovely blog. I've been going back reading some of your older posts and am enjoying it very much. I've just signed up as a follower so I should be able to read your posts more often now. 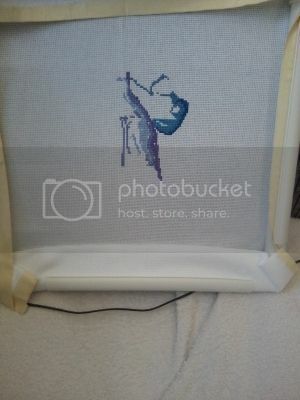 I have lots of unfinished cross stitch projects, I really must find the time to get back into them. I have a small blog at www.sillygoosequilts.blogspot.com which I'd love if you visited - I mostly quilt and crochet though I do like to try many things. I've also got a pile of hexies on the go, plus I am the UFO queen. Thanks again for participating in the GYB party - it's so much fun to meet new people. Nice blog. I am a serial starter also, way too many WIPs. Please enter me in the drawings. Thanks. I have many projects going on as well and love being a multi tasker. Your projects are so nice. Would love to win your giveaway! Lovely crafting! Love the belly dancing, looks like fun! Hi Tazzy, Nice stitching, belly dancing certainly keeps you fit and is so graceful. Hope you can visit my blog. Just stopping by to quickly say a friendly "hello" from the UK via GYBP. Your cross stitch work is lovely. Oh and well done you on belly dancing. What a fun way of keeping fit. Hi Tazzy, love your blog header and interests. You also have a very fun blog voice too. Looking forward to following you on bloglovin - so long as the whole following thing doesn't make you feel paranoid...lol! Visiting your blog from GYB. Seems like you are quite busy and have a beautiful little daughter. Sounds like a fun giveaway. For someone who doesn't like sharing info ... you gave a lot away about yourself ... bellydancing, cross stitching, a mother ... although seriously it will probably cover most of us. Almost done bellydancing myself. The time ended being the major factor. I so need a set of drawers like yours! Can I borrow your dad for a few weekends. For leftover threads try maybe bobbins ... I have mine labelled in a box and when I am doing a small project I dig in. Would love to enter both. Never tried the 1st style ... very curious. Having me own giveaway too ... not sure of what yet. How disorganised can one get? Your cross-stitching is lovely. I love Mirabilia patterns. (Actually, I have two and now I am itching to finish a project so I can work on one of those!) I look forward to seeing more of your work. Hi Tazzy, I'm popping in from the GYB party. I'm not surprised you have things on hold for now your daughter is a real cuty. She comes first, they grow up so quickly nowadays and learn each day. I loved it when mine were babies then the grandchildren but even they are all but one working or in college/uni. The youngest is 12 now an at high school. I look forward to catching up with you. Here via GYB and so glad I did. Genevieve is a sweetie - and that's a darling blanket you're making her. I'm a new follower. I tried belly dancing lol and that's all I'm going to say! Love the picture of the CEO! Visiting from GYB. Your cross-stitching projects are great -- thanks also for the chance to win one of the goodies.